room to grow: Painting Tips! At no such time should Steve ever paint a wall surface. I have almost 4 years of working in the paint industry- have helped hundreds, maybe even thousands, of people troubleshoot their painting projects- and I cannot paint a wall and make it look good! I have the know-how, but just can't execute. Thankfully my wife knows how to wield a roller and brush! -Never brush or cut in on an exhaled breath. To acheive true steadiness of hand, brush while inhaling or hold your breath. -Working with quart size paint cans can be very messy. Eliminate the sloppiness by wrapping an elastic band vertically around the paint can. When you go to dip the brush, run the bristols along the rubber band to catch any excess paint. This will result in a cleaner job and proper storage for the paint can. -Buying tray liners is a big waste of money and such an inconvenience. Stop it! Instead, grab a grocery store plastic bag, wrap it around the painting tray, push it flat, and start painting. This trick can also be done with a sheet of aluminum foil. -How much paint should you buy? Calculate the wall area to be painted and divide that number by 350. That's how many gallons you'll need. If you're doing two coats- double that number. 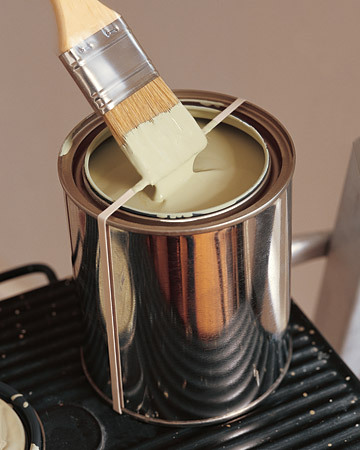 -Once the project is complete, store the paint properly by ensuring the lip of the can is free of paint. Place a sheet of Plastic Wrap over the can before hammering the lid on. The plastic wrap will keep an even tighter seal on the paint, allowing it to last for a long time.